Don’t you just love it when Halloween is on a weekend?! It’s time to let the kids party late, and eat candy without having to worry about getting up early for school the next morning! Are you planning on throwing a Halloween shindig, but need some new, tasty, creepy, and easy treat ideas? There’s no need to spend your time scouring the internet for what to do because we’ve got your back! In fact, most of these are so simple that the kids will be totally capable and happy to help you get them done. Read on! Here’s how you do it: Carefully insert the sucker stick into the center of the cookie. Dip cookie sucker into melted white candy coating, immediately stick on candy eyes, and let dry on wax paper. 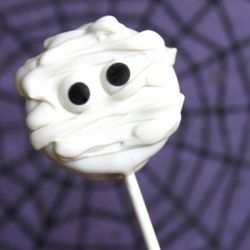 Use a piping bag (or plastic bag with the corner cut off) full of more melted white candy coating to drizzle white lines across the cookie pop and over the eyes. You can use a ribbon piping tip to get the wider ribbon like lines. Here’s how you do it: Cut off very bottom of Nutter Butter with a knife to make a straight edge at bottom, carefully insert the sucker stick into the center of the cookie, dip cookie sucker into melted white candy coating, immediately stick on candy eyes, and let dry on wax paper. Create “screaming” mouth with black edible writing pen or black frosting. Here’s how you do it: Spread the broken cookies, crushed pretzels and raisins onto a lightly greased small baking sheet. Melt white chocolate in a bowl set over a pan of simmering water, or in the microwave, stirring frequently until melted taking great care not to over heat it, as white chocolate burns easily. Drizzle white chocolate on top of cookie mixture in the pan, smoothing the top flat with a rubber spatula to coat evenly. Top with candy corn and sprinkles. Let cool until firm. Break into pieces and store in an airtight container. Here’s what you’ll need: Hot dogs, buns, ketchup – yep! It’s that simple! Here’s how you do it: prepare hot dogs as you normally would, (Grilled hot dogs look extra creepy) then slice off a thin section to look like a nail bed. Then, make a few cuts in the center with a knife to represent the knuckles. 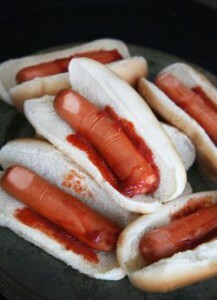 Place the hot dogs in a bun already dressed messily with ketchup and enjoy! Or at least try to enjoy…They look pretty darn finger like. Here’s how you do it: Pour water into an ice cube tray and add a gummy spider to each of 12 compartments. Freeze for at least 4 hours. Fill rubber glove with water; tie and freeze for at least 4 hours. In a punch bowl, combine punch and soda. Add sherbet and spider ice cubes. Rip and remove rubber glove from hand-shaped ice; add to punch. Serve! It looks creepy and tastes great!